It was nice to see a Canadian Coffee Roaster so established. 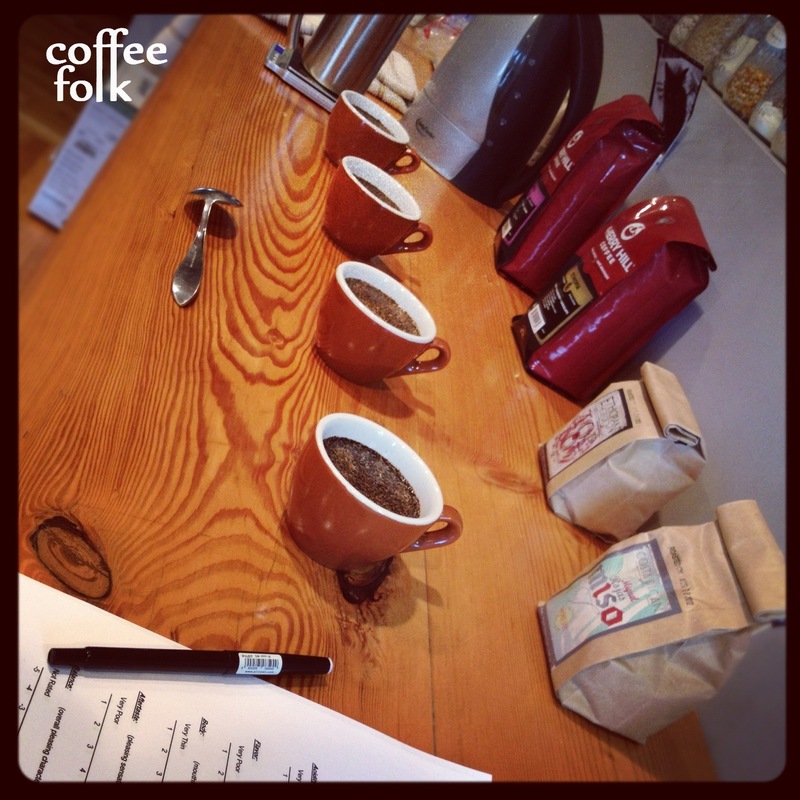 Cupping four coffees at a time. 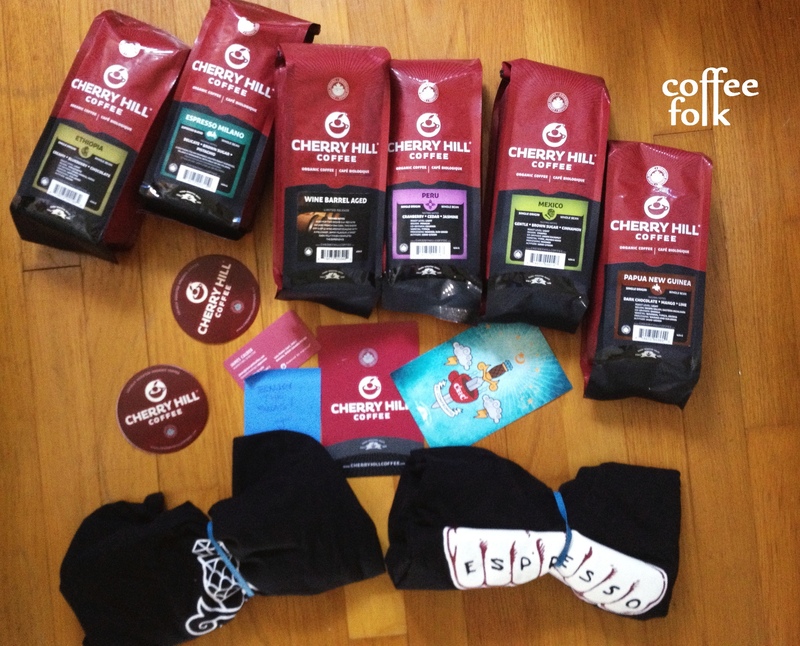 The following afternoon I spent a few hours sorting through everything and cupping all the coffees. I had to narrow down what I thought were the best coffees, and then make some decisions as to what I thought I could get from each coffee. The roasting profile used for most of these coffees seems to result in a relatively low acid coffee in the cup. For those of you who are long time readers, acidity is something I really look for in a coffee. Personally, I found these coffees were more suited to espresso brewing. Nevertheless, I made sure to give each one a chance. The top two coffees James sent were the Ethiopia Yirgacheffe “Gedeo Worka” and the Espresso Milano light roast espresso blend. These are the two I’d like to explore in this post. However, one other that deserves mention was a particularly surprising “Wine Barrel Aged Coffee“. Apparently they age green beans in an empty merlot barrel (from a local winery who just finished bottling) at the roastery for two weeks, turning it every day. The resulting french press coffee was heavily dominated by cassis and purple fruit. This was no every day coffee… It was certainly worth trying, but I wouldn’t want to roll out of bed with a hangover and try to gulp down a merlot infused coffee! Personally I found it to be a little overwhelming with cassis and purple sour-candy-like flavours. 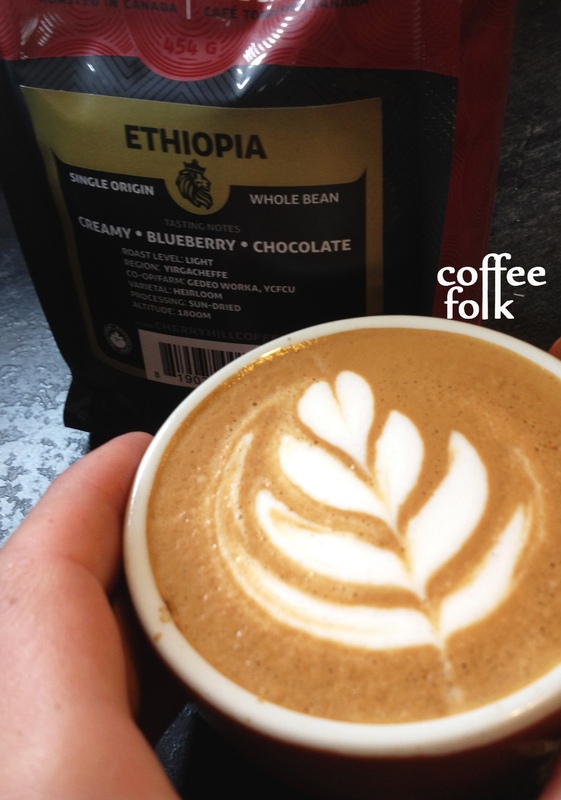 This coffee is produced in the Gedeo region of northern Yirgacheffe bordering on Sidamo. It is collected from area small farms and processed at the Worka cooperative. It is a natural process, Heirloom varietal coffee. I found this was a pretty nice representation of a coffee from a region of Yirgacheffe near Sidamo. I found it had a very berry dominated profile with some nice citrus/ lemon and spice. I’m going to say straight-up that I found this was best on the French Press… the Pour Over methods didn’t do justice or emphasize the best aspects. Ethiopia Yirgacheffe as a cappuccino. It was in the French Press I found I was able to get the maximum sweetness from this coffee. It was brewed 24grams of coffee to 400mL water in a steel Frieling. The overall cup was dominated by a blueberry, spice and chocolate on nose, with lemon and berry on the palate. The finish was a mostly cocoa (almost a little dusty). I also thought it would be fun to play with this coffee as an espresso. For the most part I found this liked a medium dose in the range of 18.5 – 19.0g of coffee to 30-31g of water. On the E61 machine I found it was best with at 93 degrees Celsius in 26 seconds. I was able to get some real nice baking spice notes, blueberry and lemon. This really worked well in 3-5oz of milk as a cappuccino or macchiato. All the best aspects cut through the milk: think baking blueberry pie and caramel. This espresso blend was a bit of a throwback for me. Amidst all the single origin espressos and the lighter, brighter blends this one really holds true to the oldschool Italian blend. Thankfully, it’s a “Northern Italian inspiration”… meaning a lighter style roast. This was a robust espresso, and leading into the fall season it was a welcome shift. I’ve included a short video working with the Espresso Milano blend, and below are my notes. This, much like the Yirgacheffe listed above, was pulling well in the range of 19.0g of coffee to 30-32g of water. On the E61 machine I found it was best with at 93 degrees Celsius in 26 seconds. This was a simple espresso. Nicely dominated by chocolate, cocoa, vanilla and a little spice/ cedar on the aromatics. What can I say? This was a good workhorse espresso for everyday use. In milk I found myself going a little finer on the grind as to get 28-30g of espresso from the same 19g of ground coffee in 26 seconds. This really boosted the sweet chocolate notes in milk. Again, this was a real throwback: I found notes of milk chocolate, vanilla, and malt. A 5oz cappuccino had a nice malted milkshake-like feel. Big thanks to James for hooking me up. Have a look out for “The Best of Coffee: September” coming in the next week!